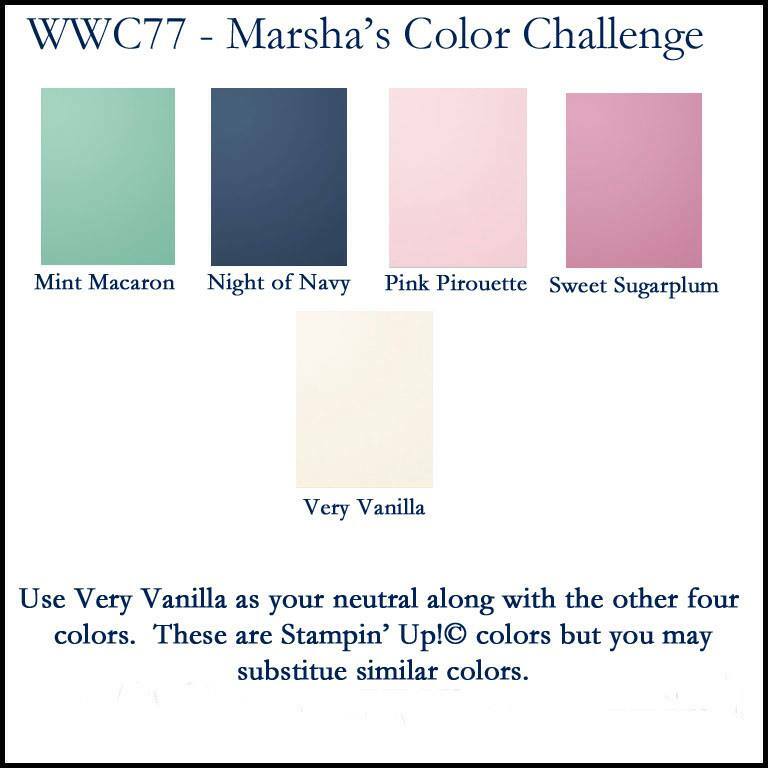 Marsha has put together a fun colour challenge for us this week at the Watercooler Wednesday page! For this challenge, your ‘neutral’ colour is Very Vanilla, and you must use all of the other 4 colours she has shown. I brought out one of my favourite stamp sets that carried over from the last catalogue – Awesomely Artistic. I started with a 3 3/4″ x 5″ panel of Very Vanilla cardstock, and stamped the flower image in Memento Black Ink. I then used my Blender Pens and coloured the flowers in with Sweet Sugarplum ink, and the leaves with Mint Macaron. After colouring them, I went back and used the Sweet Sugarplum and Mint Macaron Stampin’ Write Markers to add more depth to the flowers and leaves. I stamped the dragonfly onto Vellum cardstock in Night of Navy ink, then brushed it with the Clear Wink of Stella pen. The label was stamped in Sweet Sugarplum ink, and the sentiment in Night of Navy, then cut out and added to the card using Stampin’ Dimensionals. Before attaching the sentiment and dragonfly, I used the dots image and stamped in Night of Navy and Sweet Sugarplum (full strength and stamped off once). I hope you’ll check out the rest of the cards on the Watercooler Wednesday blog page – then link up your own card to the challenge! I know you can come up with something fabulous! Previous Previous post: BE FLAWSOME! Wow Deb what a beautiful card. I love how you’ve incorporated all the colours from the challenge without overwhelming the design. 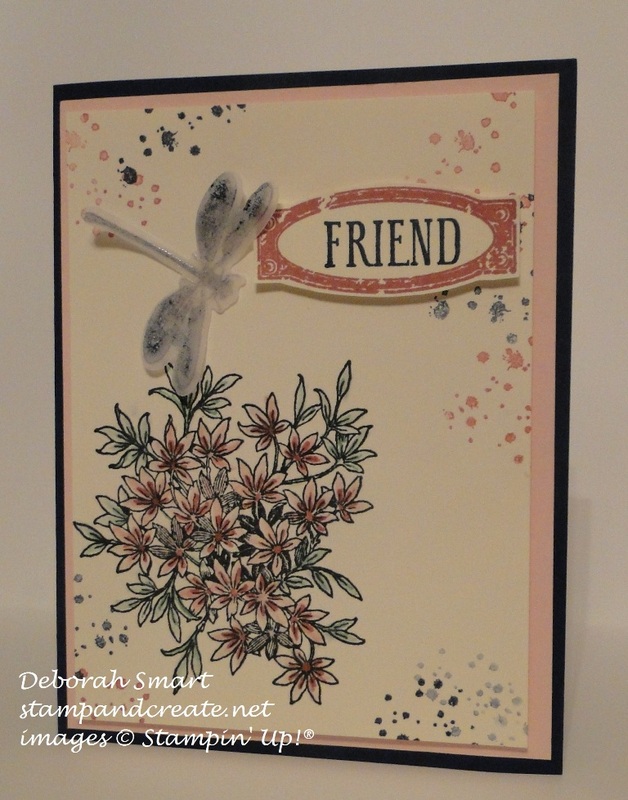 The Awesomely Artistic stamp set sure sets a peaceful tone with this arrangement and I love your vellum dragonfly. Thanks for sharing!